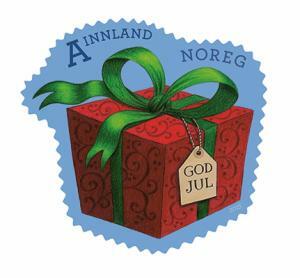 Since the 1870s, Christmas post and Christmas cards have been an important part of the Norwegian Christmas tradition. Letters and cards to family and friends are part of the preparations during Advent, and Christmas cards are treated like important memories. The first Christmas card was sent in Norway in 1870. In Europe Christmas cards had been a common method for greeting family and friends for a while before it reached us. At first, European cards were simply copied and given a Norwegian text. The first Norwegian-produced cards had winter motifs, and there were often skiers in the motif as well. In addition to birds in a sheaf of wheat, the pig was a frequent Christmas card motif. When “Der Weihnachtsmann” and “Santa Claus” made their entrance into European Christmas celebrations, we were quick to follow, and Santa Claus became a very popular motif. After a while many of the cards had humorous motifs. Many of the Santa cards to Kjell Aukrust are very popular collector’s items and draw high prices at auctions, and Aukrust himself was particularly gifted at giving his cards a humorous touch. Christmas stamps are more recent. Austria issued the first Christmas stamp in 1948, which was a commemorative stamp for the hymn, “Merry Christmas”. 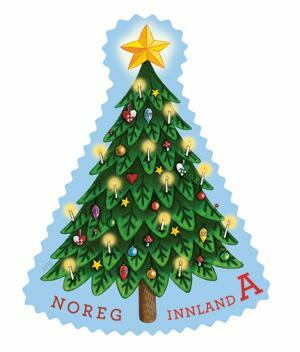 The first Norwegian stamp for Christmas post was issued in 1971. Olav Bø, a professor in folklore, wrote a book about “Our Norwegian Christmas” more than thirty years ago. In the chapter about Christmas preparations, he had a separate section entitled “Christmas post”. Bø commented that sending cards at Christmastime was an important part of the holiday’s preparations, together with the Lucia celebration, the baking of Christmas goodies, family, beer-brewing, light-hanging and present-wrapping. Christmas presents and the Christmas tree are the motif on this year’s Christmas stamps. They will have decorated many Christmas cards before the joyous day arrives.